Search Engine Optimisation or SEO is a completely new challenge for small, mid-sized and large businesses. However, many do not know the basics of SEO strategies and thus, go wrong in this digital age. Recently, Google has changed its search algorithms and followed user behavior to favour mobile-friendly websites in their rankings. 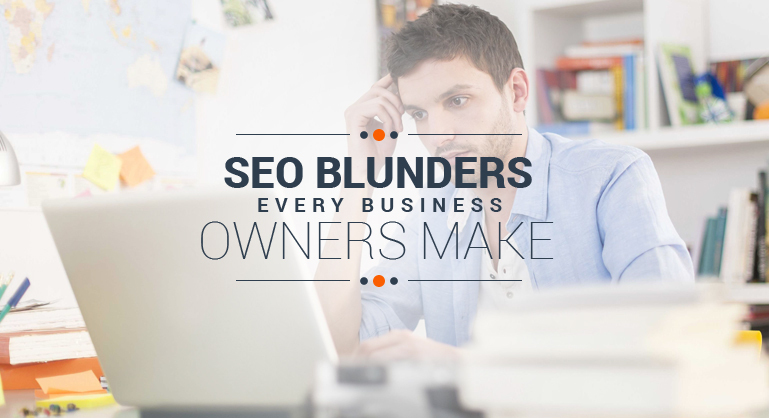 Check out top ten SEO mistakes business owners make these days. Not considering mobile users – Many businesses perform SEO without thinking about mobile traffic. This is considered to be a key component for their marketing strategy. Almost 40 percent of online users browse websites with their mobile phones. Google has released mobile specific algorithm that helps monitor and track the performance of certain websites. At the same time, businesses also should think about mobile users just like desktop ones. Improper structure of websites – Many people build their website structure without any SEO strategy for local businesses. Adding different categories, product lines and information pages provides result that is a bloated structure of your site. This provides less value to landing pages and various categories and thus, prevents users from migrating around your site. By getting your website wide audit, you can overcome this mistake which is made by many businessmen. Inappropriate SEO objectives – Many stakeholders set wrong objectives for SEO rankings. An effective SEO campaign should be divided into quarterly segments with particular objectives set for every quarter, based on the campaign. Duplicate meta tags for product pages – According to the experts of a reputed SEO agency in UK, several database websites consist of meta data like descriptions and title tags due to the set up of bad content management system (CMS). With the installation of customised formats or plugins for database webpages, you can overcome this mistake. Perform site migration without informing Google –Websites are being migrated on new domains or further re-launched with new URLs. As such, the relevant redirects and notifications are not performed. When URL locations change, 301 redirects should be created to ensure that users arrive at the specific destination within the website. When a website gets migrated to a new domain, Google should be informed by using the tool known as "change of address" within Search Console. This enables Google to update their indexes. Not incorporating Google Search Console – Development team spend hours in creating cutting edge functionality for the websites however, forget to include Search Console tag. Without it, Google cannot notify webmasters of website issues and SEO updates won’t be performed. Not updating Sitemaps – Experts of SEO companies in UK considers it very important to update sitemaps. It will provide better visibility and easy navigation by search engines at the time of indexing your site. But it provides opportunity to search engines about any change made on your website. Dynamic sitemap allows you to update and inform search engines when any webpage is added. If webmasters pay no heed to add a sitemap, search engines will require more time to index and crawl the website. This is certainly a bad news in case you make daily updates. Migrating a site to new platform – With the growth and success of business, there arises the need to migrate a website. You need to consider the impact of SEO specialist agency in UK that consists of data migration, 301 redirects and user journey. Drafting a migration plan enables stakeholders to become aware of the work done by each party and time limited associated with it. By migrating a website in the wrong way can have an influence on rankings, conversions and traffic. Using duplicate content on the product pages – Many websites accept content through xml feeds however do not match with unique content. This is one of the biggest mistakes made by business owners as they do not know the propositions of content pages. Opinion polls, user reviews and in-house descriptions are different ways of accepting content written by third parties. This is quite similar to content written on other websites and considered as duplicate by Google. Google considers more than 200 signals when choosing a website to improve its ranking. A lot of experience, expertise, system and time are required to measure the signals and make them better. Though developers know the importance of SEO, many undervalue what it exactly requires to deliver SEO campaign.